Office Hours: Tuesdays, 1:30-2:30 p.m. Please contact Andrew for information pertaining to SCMA’s Fall and Spring Trips, including time and date, location, registration, travel, missed classes, room and board, and any other related questions or ideas you may have. Andrew offers one chair position for each of these trips. Please reach out to Andrew if you are seeking an opportunity to get more involved with SCMA, and also learn how a chair position can build a resume and launch your career. Hey everyone! My name is Andrew Brown and I am a senior majoring in Supply Chain Management with a minor in Sustainable Natural Resource Management. This is my first year on SCMA’s executive board and I can’t be more ecstatic to serve as the Director of Operations. I’m eager to plan and improve on our bi-annual corporate trips as well as plan council company visits within the state of Michigan. Outside of academics, I am a big wakeboard and watersports enthusiast, dedicated Izzone member, and avid fly-fisherman. SCMA has added immense value as an undergraduate student, helping improve both my professional and interpersonal skills. 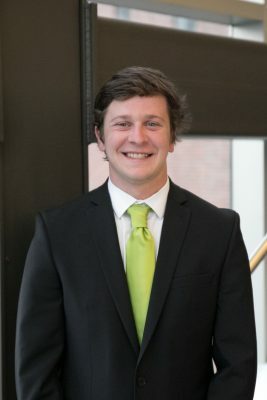 I can honestly say I wouldn’t have landed my internship as a Materials Planning Intern at Ingersoll Rand this past Summer without the connections and support from SCMA’s leaders and members. I am so excited to meet and develop relationships with our members this year. If you have any questions on internships, resume critiques, or need an honest opinion on anything academically or socially related, feel free to reach out to me!